Taking place entirely in the ultra-orthodox Jewish community in Brooklyn, Menashe is a gentle and heart-warming family tale that places us in an insular world that many of us have never experienced and still finds a way to connect and make it genuinely relatable. The film is not only a showcase for the rarely depicted Hasidic community but it also utilizes Yiddish, a language that audiences likely aren’t accustomed to hearing at length, as its primary method of communication. 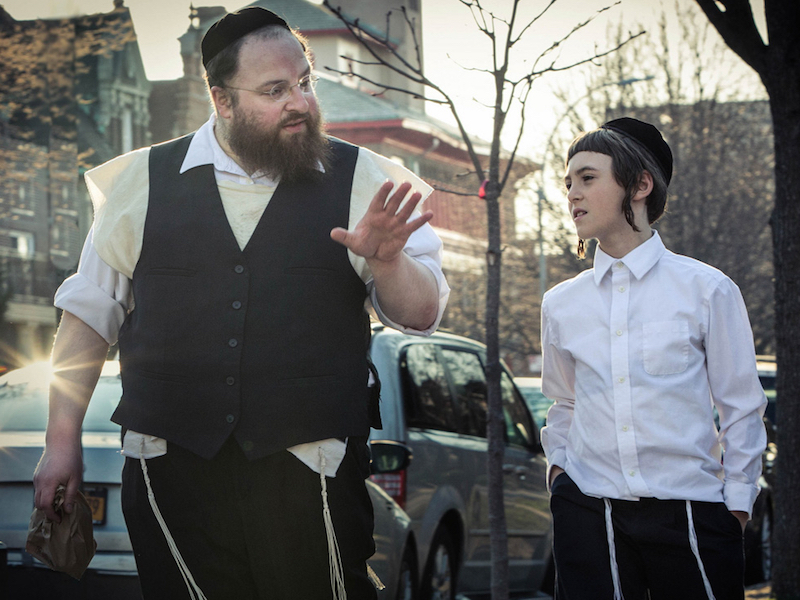 Its inclusion of authentic locations and real Hasidic actors lends a credibility that crucial for a movie like this to succeed and even though the story is small in scale, it’s no less absorbing and poignant than more ambitious work that’s come before it. The title character, played by Menashe Lustig, is, to borrow a Yiddish term, a bit of a putz and can’t seem to navigate through the obstacles that life has thrown in his direction. Following the loss of his wife, his teenage son Rieven (Ruben Niborski) is mandated not by the courts but by the head rabbi in their community to live with Menashe’s disapproving brother-in-law Eizik (Yoel Weisshaus) and his family. Without the presence of his son in his life, he left to reside in a depressing studio apartment and slave away at his unfulfilling job at the local market, waiting for things to turn in his favor. Menashe tries to step up and rise above his circumstances in small and big ways throughout the story but for one reason or another, the struggle always ends up being more than he can handle by himself. He feels pressure to re-marry, in part for the partnership but mainly so he can create a fitting household for his son, but in a brutally humorous scene which depicts an arranged blind date that goes sour in a hurry, it’s clear that there may not be another woman out there for him. A planned memorial for his late wife seems to be another occasion where he can prove to Eizik and his judgmental friends that he’s on the path to mensch-dom but even a “bachelor-proof” kugel recipe proves too much for Menashe’s culinary capabilities. First time writer/director Joshua Weinstein crafts the perfect combination of situations in which to place his main character so that we can take in such a thorough and tender portrait of a struggling widower. It’s hard not to be empathetic to someone whose hang-ups constantly seem to be getting the better of him, especially when the person in focus is such a gentle soul by nature, and Weinstein plays these day-to-day dilemmas with just the right mixture of comedy and tragedy. Lustig and Niborski also have a playful chemistry that had echoes of the father-son relationship in Roberto Benigni’s Life Is Beautiful, even though the stakes in this story are decidedly much lower. The production is rounded out with some exceptional technical aspects, including simple but effective camerawork and editing that never takes its eye off of our harrowed protagonist. The spare but gorgeous score, which introduces a lovely melody on violin that flows out over a quartet of strings, is the perfect way to musically encapsulate Menashe and within the first minute of it playing over the opening scene, the hair on my arms stood on end and soon goosebumps followed. Menashe is a small delight of a film about standing out in a closed group that doesn’t reward individuality and finding one’s own slice of happiness away from the overbearing constraints of society.